I had a lot of different styled frisbee type toys when I was a kid. Large ones, small ones, discs and rings. It was fun playing with the ring types. I would try to catch them by putting my arm through the hole. Many of my favorites met their end baking in the summer sun on the roofs of the neighborhood houses. It’s funny how we had purchased so many different kinds over the years and the best frisbee we had was a free one my parents got from the ban. This one is easy. It’s game week! quite recently I managed to use an anzac biscuit as a frisbee. It worked pretty damn good too… Except it was hard enought to hurt. Seriously, you could throw it as hard as you could at the brick wall and it would just bounce off, retaining almost all of it except a few chips and it’s shape. But really, it hurt. One time my mother decided to play Frisbee at night. 2 minutes later, she decided to come back inside. btw: Although this is my first post here, I’ve started reading about a year ago and managed to read it through from start to end. I found out that I can get into many Biffish situations myself but being lucky I came out of them with only with a few scratches and scars. I am totally stunned at what kind of items biff have. I hope Biff does have a dog, knowing him its either a super dog that will catch his frisbee no problem, or it will regrow the top of its head like he does after such a mishap. The closer you are to Biff, the more you risk becoming exactly like him, so his dog must be pretty invincible and accident prone by now. @Alex G – It blew up? Hey, Biff’s not on the receiving end of things this time! @Chris about Alex G: I think he means it was an inflatable frisbee. Otherwise I really want to hear about the mishap that led to this. @insertnamehere: That wasn’t an anzac biscuit-frisbee. That was the top-secret anzac death-ninja throwing star! The anzac death-ninjas are even now hunting you down for revealing their secret techniques! Flee..! I hate playing frisbee after the dogs have had a go. They chew the edges of the frisbee, and leave it full of pointy jagged edges that *hurt* when you catch a hard-flung disc! i think the best frisbee i’ve played with was a bike tire. they work surprisingly well if you can get the knack of throwing them. at one point, i had some neighbors who came up with a bunch of stuff like bike-tire frisbee. i wouldn’t be surprised if they would use saw blades given the chance. given an old dryer, they dismantled it and rolled each other down the street we were living on in the drum. If he was playing disc golf, the trees would be less of a problem. i think i once owned a magical boomerang, if that counts…..
i threw it, it went outwards, rotated to come back to me, then it would rotate again and fly out further before finally spinning to a stop at my feet….it was really strange to see…..anyone willing to try to explain how this worked? I had a wooden boomerang in the desert. I threw it around, trying to get the hang of it. It’d bounce off the rocks. I’d retrieve it and try again. By the time I got good at getting it to come back to me it had rough jagged edges spinning towards my head. @MOD: Lift and gyroscopic precession. As the boomerang moves forward, airflow across the advancing limb of the boomerang is faster than the airflow across the retreating limb. The advancing limb thus generates more lift, tending to ‘twist’ the boomerang’s flight, but because it’s rotating, gyroscopic precession alters the felt location of the thrust, which tends to *turn* the boomerang, instead of flipping it, creating the familiar curving path. Drag reduces the speed of the limbs of the boomerang as they rotate, thus reducing the overall lift AND the felt precessing force, so the circuits that the boomerang begin to become flatter, slower, and more open. Eventually, it slows enough to lose the remaining lift and falls to the ground. You were just fortunate to have one that had a perfect lift/drag balance for your style of throwing. When I was a kid my brother used one of those old tops to a tub of peanut butter for a frisbee. They were ridged to help grip, which made them serrated while spinning in flight. Got a pretty nasty cut on my eye when he threw it at me. First post for me, been reading for a few months now. Chris: Love the Comic, it’s so wonderfully random and creative. What? No Jarts(TM)? I loved Jarts(TM)! I loved trying to fling a 160g flying disc so hard that it would embed itself in my neighbor’s hedges, too. It was a dog model, meaning the edges were somewhat concave (ie, the cross section looked more like a flamenco dancer’s hat than the usual Frisbee(R) profile). I could get that sucker up to 50-60MPH, and 160g hitting you at 50-60MPH is NOT your idea of fun. As for the Jarts? My cousin and I would both hold 2′ square pieces of plywood and then we would chuck ’em high in the air at each other and then catch them in the plywood…CHUNK! I had the great fortune of being friends with a person who decided to bring their plastic frizbee to school. My group of friends ate outside the Math and Science building, where there was a nice open space to run around and… play frizbee. First or second day they brought that thing, we got it stuck on the roof of the building, which is slanted and isn’t too high… so you could see it if you looked up. … And as far as I know, it’s still up there. I did in fact buy a Frisbee today. @Chris and @Psymon – It hit a brick wall dead on and broke into many more pieces than you would expect a rather solid piece of plastic to break into. So I just said that it exploded which one might assume if they saw the aftermath. But having it literally explode in mid-air… Hrmm… Might be fun too. This is my first post here. I’ve read all the biff comics so far in less then a week, and I have to say, I think my eyebrows are growing…and my arm fell off yesterday, it’s now back on. You guys gotta try this! Once upon a time, when he was a younger man, my father worked for AARPA, the predicessor to DARPA – You know, the American military mad-scientist death-boffin agency? The played around with a ring-shaped frisbee-greande at one point. Oh, they called it an anular airfoil anti-personnel device, but it was really an exploding frisbee. On with the underside filled with embedded steel shot, like a claymore mine. Think about that… Sitting in your nicely entrenched fighting position, when this death-frisbee flys overhead and explodes, shotgunning you with steel shot. Ouch. But, perhaps fortunately, they couldn’t resolve accuracy and timing issues – Some soldiers simply can’t throw a frisbee accurately to save their lives, and some would huck the thing too hard, or not hard enough, leading to random detonations all over the target range. Biff’s holding it wrong. If he throws it the way he’s holding it now, the point of a tooth is going to pierce the back of his thumb. Instead, he should be holding it so that the teeth point towards his palm. What’s really scary is that’s the *first* — and for a time, only — thing I noticed wrong with the picture. That could just be the countless hours of Half-Life 2 talking, though. Gravity gun + sawblades + zomibes = hours of fun! Knowing Biff, that Frisbee’s probably inflatable. @DarkRyder-zomibes! cousins of zombies, instead leaning back to dodge your shotgun bullets like in the matrix, their head falls of so your bullets cleave empty space! Then they pick it up and throw it as far as they can in order to see where the humans are. 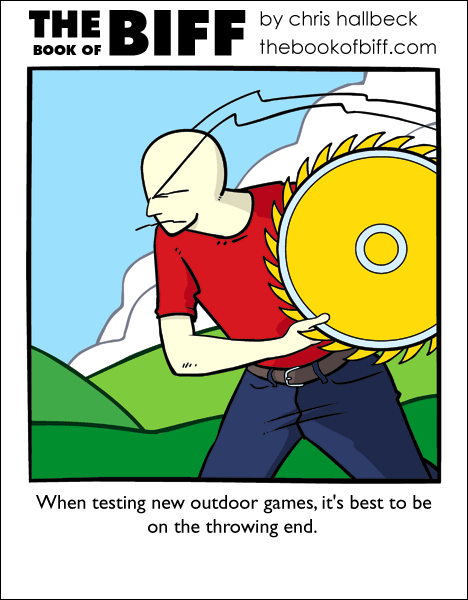 This holds true except when using boomerangs, yo-yos or cats as your throwing object. @ trevor- Of course there are others. Biff would have an extremely boring life if he had no friends. And as someone else put it, they would have had to become similar to Biff. what do you mean when you said that your parents got a Frisbee from the ban? Whats the ban? That frisbee looks like the dog toy frisbee that my dog has already chewed up at least 60% of. The disturbing part is that it’s a Nylabone frisbee and anything made out of Nylabone is supposed to be indestructible.